It takes a perfect killer... to kill a perfect killer! Harry chapman is in prison. He manages to avoid serving his sentence in return for working as a hired killer for the Syndicate. After a time he becomes tired of violence, he is a tired man, begining to feel old and wants to have some peace. Before begining his new life he seeks revenge on two people who doublecrossed him. They are Krista, with whom he is still in love, and Jack, her present husband. The Syndicate has sent Luc to eliminate him, Luc is a sadistic young killer. An action thriller, with Lee Van Cleef playing the roll of Harry Chapman, and Robert Widmark gives a fine performance as Luc. Everything you would expect from a good crime thriller. 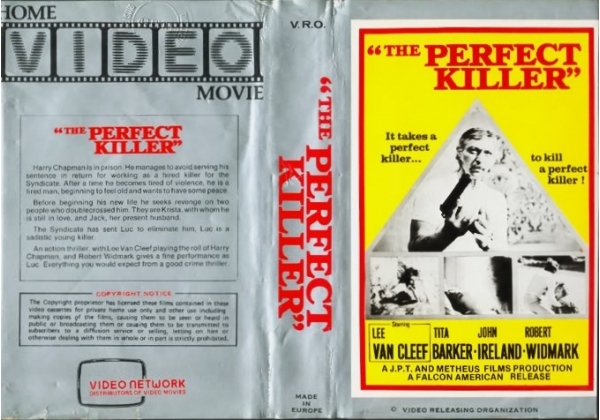 Or find "Perfect Killer, The" on VHS and DVD / BluRay at Amazon.